Until I read the book SUPERLIFE (Thanks from the bottom of my heart to Karen Wrenn), I thought the “best me” would be a thinner, leaner me. So I had sworn off beer (Yes, I live in beer-town Bend, Oregon), then I did Weight Watchers (points vs activity), dabbled in Paleo, learned the “SUPERFOODS -Top 14 Foods That Will Change Your Life.” ( an eye-opening book by Steven Pratt and Kathy Matthews). I even worked hard on following an “acid-reflux” diet when some disturbing symptoms made me worry. That led to Alejandro Junger’s CLEAN GUT and Dr. William Davis’s WHEAT BELLY. Who knew that my biggest “crave food,” pizza, was made best with high-gluten flour. I already knew that flour products wreck havoc with my joints where arthritis (yup, inflammation) has set up a home. When I avoid all flour products I have less ache-y and swelling and more energy. That has been a fairly easy habit to maintain for the past 5 years. Back to SUPERLIFE. Who knew that a very real, solid and do-able strategy was a simple as an alkaline body, something above a PH of 7.0. Uh Oh! Just when chemistry seemed like a long-ago thing you had to study. Of all the “diets” and eating plans/rationales I studied, SUPERLIFE made the most sense. Author, Darin Olien, is fully immersed in the work he does – and we can all benefit. Their MISSION: We provide resources for people to make the simple lifestyle changes needed to live a healthy SuperLife. Balance is something we standup paddlers know alot about. And SUPERLIFE is about a balance of 5 “Life Forces.” These are: nutrition, hydration, oxygenation, alkalization and detoxification. In the most balanced and logical manner Darien took me on a fascinating journey during both the first, and second, reads of his book. And so, finally, I discovered the rationale behind something that might seem too simple. Darin explains the five simple fixes that will make you healthy fit and (yes, this) eternally awesome. After my reading, I listed suggested foods that would add to my alkalinity – actually wrote down the ones I could eat regularly, easily. I then made a list of things that added acidity – just to keep me focused on avoiding them. No, you don’t need to NEVER have those (sugary things, caffeine, alcohol), but you need to be aware that they create an environment in your home. Yes, in your home that is your physical body, that is more acidic. There is not enough room for me to explain the entire philosophy here. But know this: I have taken the time to read and understand what are the “five life forces” and why they matter. What a big surprise! Hydration is right up there with nutrition, followed by the gift of a cardio workout – oxygenation. Then along came the “life force” I never even considered: ALKALIZATION. What? That was the biggest eye opener – and on a very strict eating and workout plan that generated the most alkaline me I discovered an energy and wellness level that I hadn’t felt in a long, long time. By the time I got to the fifth life force, detoxification, I was on the band wagon. There are so many ways to feed your water athlete self. If you really want to make a difference (at any age), take a close read of SUPERLIFE. I would love your comments and the discoveries in wellness that you have made. I am only this young (what? 67.8 years) once. I am dedicated to making the best of it. We often get questions about what equipment is needed for Power of Presence SUP (P2SUP). Once you download a collection of our guided meditations for paddling you are just about ready to go. While people are used to looking for a very stable – wide and with high volume – boards for SUP Yoga, any board will be fine for p2SUP. Since you will simply be paddling while listenbing to the recorded meditations for your mindful and present experience, no solid base for balance poses will be needed. We use the KIALOA Aloha (board and paddle package) so that we can demo a high value / low expenditure option. No one has been disappointed! 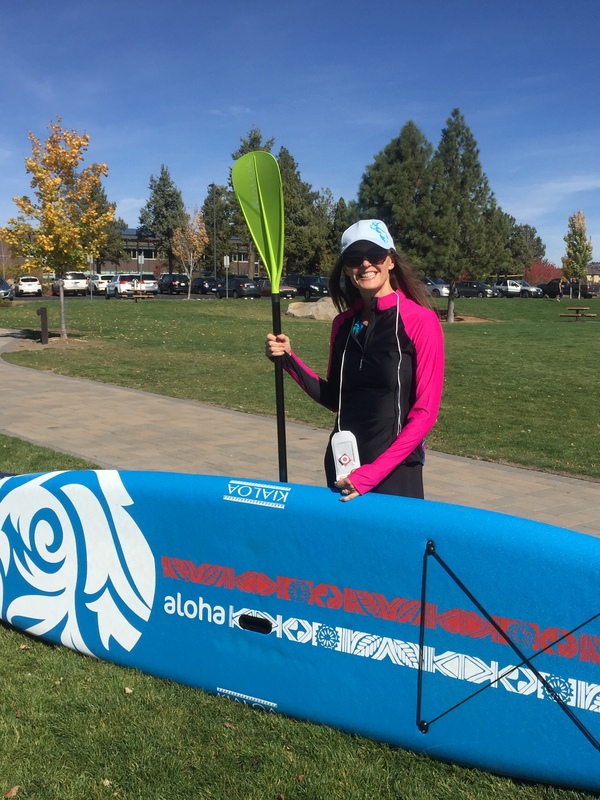 Ideal for beginners and sharing with family and friends, the Aloha is a perfect way to get started with the sport of stand up paddling. The 31” wide board provides great stability and makes for easy paddling. The soft top is impact resistant and provides a safe and comfortable way to enjoy the sport. An offset handle makes it easy to transport to and from the water. The four point tie down system is perfect for caring your water bottle or flip flops. Includes 10’ leash for safety and a 10” fin for good tracking. The tail bumper adds durability and is ideal for vertical storage. The package includes the family friendly Aloha Adjustable paddle. If storage is an issue – or if you would love to check a bag (that includes your SUP board) we also use the KIALOA Napali inflatable. We can’t count the number of times people have come back from a backpack trip (with their KIALOA Napali board and an MP3 loaded with P2SUP meditations) all stoked and excited by the experience. Whatever your needs, make your decision about what board will be best, grab your paddle and MP3 player (or waterproof case protected phone) and get out on the water. You will love the experience. You might wonder about our super-cool model. She is Cynthia LaRoche, the soul and spirit behind the meditations you will enjoy at P2SUP. If you want to learn more about all she can offer in the realm of superb yoga instruction and experience, check out Cynthia LaRoche Yoga.